What was missing amidst the array of bars and eateries at Pubtown in Creaticity (previously known as Ishanya Mall) was an authentic Asian restaurant for some soul-satisfying comfort food that could bring the whole table together. But that just got fixed thanks to the team behind The Sassy Spoon and Baraza, Bar & Bites who after much contemplation conceived Wicked China, the newest Asian restaurant to hit the city. If you have been to Hong Kong, Wicked China will remind you of a quaint eatery straight out of the vibrant streets of Mong Kok. With its Stranger-Things-inspired neon signage, outrageously quirky Chinese kitsch, ceiling lights that look like conical hats and peppy red-and-orange decor, Wicked China is whimsical and wonderful at the same time. While the ambience was an outright winner, at first sight, our four-course meal at Wicked China took it infinite levels higher. In fewer words, Chef Gautam surely knows how to whip up a storm in the kitchen and plate it in the most exquisite way possible. The spicy crab meat, for instance, was a light, flavoursome broth with a hint of spice that gets better with every slurp (sans the sucking noise). The crab, on the other hand, was tender and easy – almost like a melting delight inside the mouth. As for appetizers, the dish that had a lasting impression was the truffle and edamame dumpling with a creamy mousse-like filling made of truffle oil and butter, and well-seasoned with salt and pepper. If you don’t like mushrooms in general, go for the golden prawns in pandan leaves and wheat flakes. While the tempura prawns had a beautiful golden hue with a nice crunch on the outside, the wheat flakes gave the dish a contrasting sweetness, which was rather a nice change of flavours on the palate. For the main course, we tried the XO seafood noodles with a side of green Thai curry and Singapore chilli prawns. What made the noodles better was the spicy dried-fish sauce with chilli peppers. And here’s the awesome part: the sauce is, in fact, made in-house by Chef Gautam. We ended our meal with lemongrass creme brulee and jasmine tea and dragon fruit mousse. The creme brulee had a gorgeous creamy base with a rich layer of hard custard on top, served with a thin crispy slice of biscotti topped with dry fruits. The jasmine tea and dragon fruit mousse, on the other hand, was perhaps one of the best-looking desserts we have seen in a very long time. The vanilla mousse was silky smooth, not very sweet, not very overpowering. The dragon fruit and mango slices in the dessert gave a sort of much-needed tang to the dessert, and we aren’t complaining one bit! 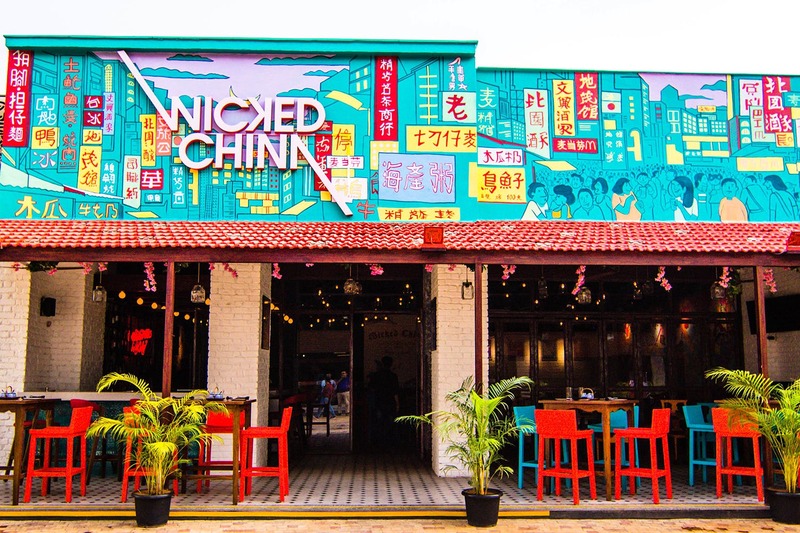 Wicked China is our kind of Asian restaurant – all about good vibes and traditional food that will make you come back over and over again.